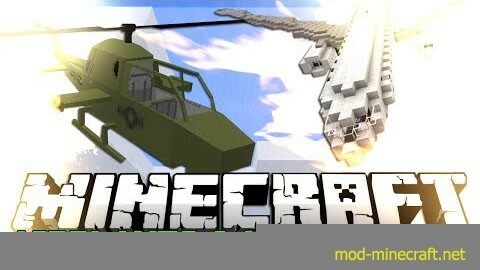 MCHeli is an awesome, highly configurable mod which adds a whole load of new planes and helicopters to Minecraft! It has a built-in asset system a little like Flan’s Mod, meaning anyone can create new vehicles without any real coding knowledge! Some helicopters can land on the water, and will float! Helicopters can also take assorted amount of passengers, including extra gunners to help fight off any targets. Planes need a bit of space to take off. The throttle will slowly speed you up, and once fast enough tilt your nose up to take off. The nose, just like in a Helicopter, is controlled with the mouse. Some planes, like the helicopters, can land on the water and will float. 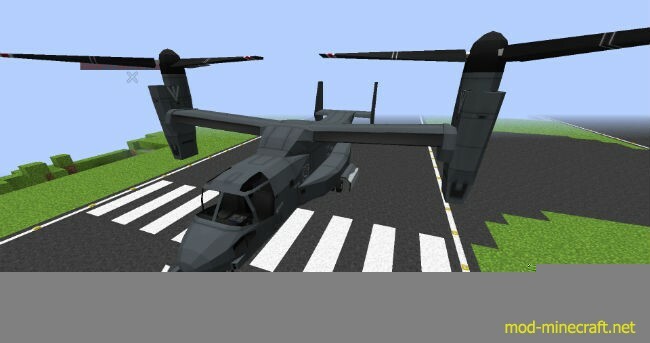 Most also have multiple seats – the V-22 Osprey for example can seat up to 14! VTOL are a special type of plane which work a bit differently. By pressing F, you can switch between standard and VTOL mode. This is currently only available in the Harrier and the MV-22 Osprey. While in VTOL mode, the controls act quite similar to a helicopter, whereas in standard mode it will fly like a normal plane. For all those CoD fans who are screaming “VTOL WARSHIP INBOUND!”, yes, the Osprey is that same ship, but without weaponry. Possibly one of the most amazing things about this mod is the UAV. Place down a UAV station, and pick one of the UAV-enabled vehicles – the MQ-9 Reaper is a good choice. When you right-click the UAV station, your character will sit down and a GUI will appear. The GUI has a single inventory slot, and a set of coordinates. Set the coordinates to where you want the vehicle to spawn – I recommend somewhere on the ground, as they start with their throttle zeroed. Once you’re ready, place the UAV’s item in the slot, and you’ll switch to controlling the UAV. There are both plane and helicopter UAVs. Most are quite standard size, but a few are quite small- like a RC toy. Some can even take passengers! The UAV does have a limited range. You should remember, you are not actually in the UAV- you’re sitting at the station. If someone sees you at that station, they can kill you where you sit. Even things like sound are still relative to the player, not the drone – it’s incredibly realistic. Another beautiful aspect of the mod is the chain system. You can chain ANY non-living entity (eg, minecarts) to a helicopter. When flying that helicopter, the chained item will hang below, and can be dropped at a key press at any time. 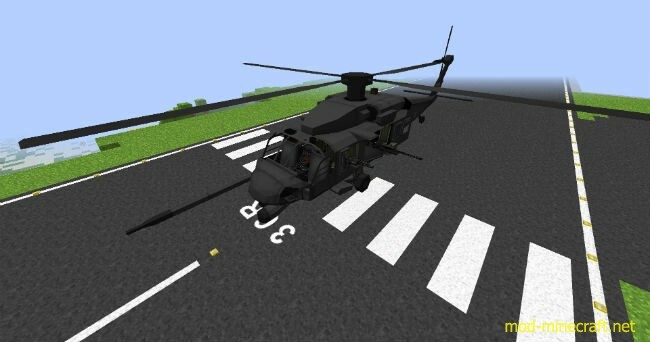 Included is a container, which is a small 54-slot chest which can be carried by a helicopter, great for server roleplay deliveries and air drops! The chain can also be used to tie ANY two non-living entities together. You could just tie two minecarts if you wanted to, or maybe airlift a Flan’s vehicle. Bear in mind, vehicles such as Flan’s titans take damage during flight and very quickly lose their legs… Oh, and don’t give them obsidian boots. Just don’t. The parachute is a single use item. Right-click with it in-hand, and you’ll deploy a parachute to guide you slowly and safely to the ground. Great as a quick escape if someone has locked on with a Stinger! The stinger missile is the only ground-controlled weapon which the player directly holds, and is also the only weapon to actually consume ammunition. It can lock on to any vehicle in-flight, and does a fair amount of damage on impact. However, weapons don’t end there… Most military aircraft are equipped with an assortment of machine guns, missiles, bombs, and even torpedoes. The only downside to these is that none of them consume ammunition. There is a configuration option to disable explosive damage. I highly recommend that for any server running this mod. But still the weapons go on! So the stinger bores you, and flying & shooting isn’t your style… Why not try out one of the many turrets! There’s plenty, from a small mounted machine gun right up to a 46cm cannon! Finally, we have the Ground Laser Target Designator; a ridiculously awesome device. Simply aim it where you like, right-click and a 3-plane airstrike will whiss past, decemating your target! This is also available from the Apache. Place the folder inside (called mcheli) into your .minecraft/mods folder. You can ignore/delete the META-INF folder, that is simply there because Curse’s file filter won’t accept files without one.